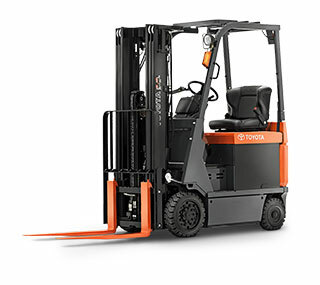 The Toyota Core Electric Forklift is a popular, 4-wheel electric forklift solution for light-duty warehouses, food and beverage facilities and manufacturing plants. With a smaller counterweight, the Core Electric Forklift is nimble enough to navigate in tight spaces and powerful enough to lift up to 3,500 lbs. Plastic Mirrors The mirrors are constructed with convex acrylic "shatter-resistant" lenses while the mirror backing is constructed of a heavy-duty gauge metal with a black powder-coated finish. Lowered Overhead Guard Lowers the overhead guard height by 4.5". The standard seat will be replaced with a low profile seat. Polycarbonate Overhead Guard Cover Secures a durable transparent polycarbonate (plastic) sheet on top of the overhead guard to prevent small items from falling through the guard. Quick Disconnects-Single Adds a set of hydraulic quick disconnects to the carriage hydraulic termination point. Quick Disconnects- Double Adds two sets of hydraulic quick disconnects to the carriage hydraulic termination points. 12 Volt Power Supply The 12 Volt Power Supply option adds a 36/48 volt to 12 volt DC power supply (converter) to allow installation of 12 volt DC powered equipment. Cloth Swivel Seat This option fits a Modura cloth covered seat with a 20 degree swivel base to the truck.